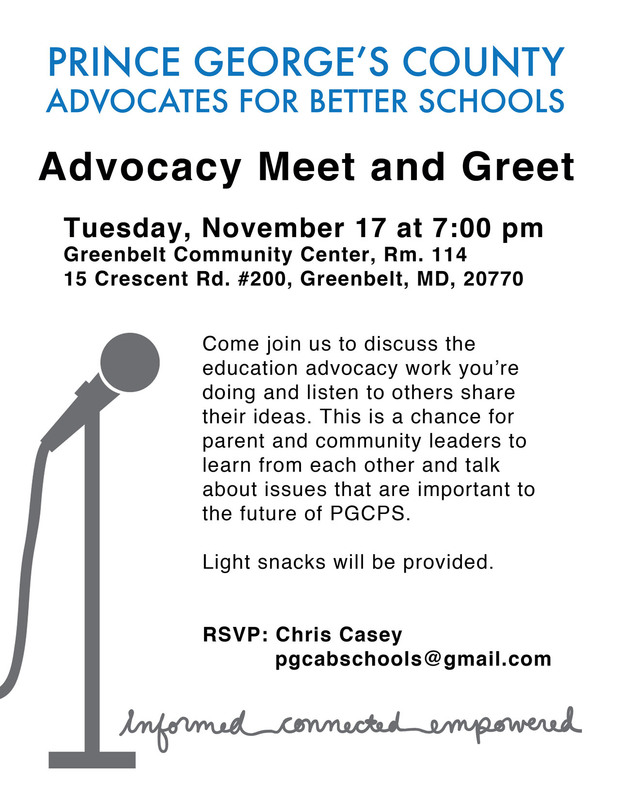 Prince George’s County Advocates for Better Schools is hosting a Meet and Greet on Tuesday, November 17th, at 7 pm, in Room 114 of the Greenbelt Community Center. This is a chance for parents and community members to meet informally and talk about the education advocacy work they are doing in the PGCPS community. We are hoping that participants will share ideas, make connections, and find common ground as they listen and learn from each other. Anyone with an interest is invited! You do not have to consider yourself a parent or community leader or education advocate to attend. Please send questions and RSVPs to Chris Casey at pgcabschools@gmail.com.